Last Friday, Las Vegas Justice of the Peace Melissa Saragosa agreed to delay the 90-day jail term Floyd Mayweather must serve due to his conviction on domestic battery charges until June 1 because Mayweather’s attorney convinced her that the fight Mayweather had scheduled for May 5 would be too difficult to change and will be worth “more than $100 million” for the Las Vegas community. Everyone’s assumption is that Mayweather’s opponent on that night will be Manny Pacquiao– almost everyone, anyway. Mayweather-Pacquiao is the fight the boxing world has demanded for years, especially since Mayweather defeated Oscar De La Hoya in 2007. While Mayweather (42-0) is the only undefeated boxer of consequence, most people seem to think that Pacquiao (54-3-2) has been the better fighter lately. Whatever anyone thinks about these two, I don’t think there’s a credible argument that they aren’t the best two boxers in the world today. There are all kinds of reasons why this fight hasn’t happened, but the key perception is that Mayweather is dodging the fight. The basis for this widely held view probably comes from the line of thinking that Mayweather, with his perfect record, has the most to lose each time he puts it on the line, together with the opinion of some that Mayweather lately has been choosing weaker opponents– big names just past their primes– to pad his record, while Pacquiao, they think, has been taking more challenging fights. The two have had a fight lined up before, though, and it was Pacquiao who backed out because he did not want to comply with the rigorous drug-testing standards to which Mayweather demands he and his opponents submit. Dan Rafael, ESPN’s boxing expert, interviewed Bob Arum, Pacquiao’s promoter, and the plain conclusion is that he (Arum) does not want Mayweather-Pacquiao to happen. Arum has flip-flopped on his client’s availability in 2012 depending on Mayweather’s availability, always saying that the matchup couldn’t work. Now, Arum is headed to visit Pacquiao in his native Philipines with a list of the names of four potential opponents, none of which is Mayweather’s. Arum is also a smart boxing guy, as are his matchmakers, Brad “Abdul” Goodman and Bruce Trampler. They know Pacquiao would be the underdog, especially given how he looked in his controversial majority decision win in November against Juan Manuel Marquez, whom Mayweather thoroughly dominated when they fought in September 2009. Arum and his people know there is a strong possibility Pacquiao will lose if he ever fights Mayweather. 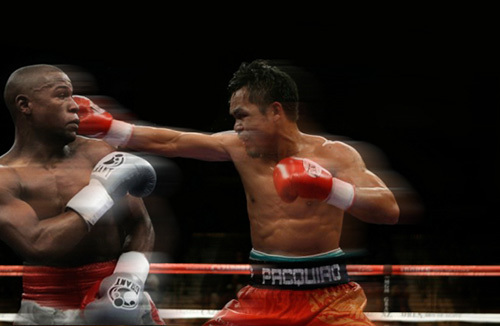 If Pacquiao did fight Mayweather and lose, he could certainly go on. But at this stage of his career, a loss might send Pacquiao deeper into politics in the Philippines, where he is already a congressman, and that would mean no more Pacquiao fights — or at least only sporadic fights — for Arum to make millions on. I won’t believe the match is happening until I see the two men in the ring, but it is nice to see Mayweather take control of the narrative. I hope a side effect of his push in the current round of negotiations will help correct the view, described near the beginning of this post, that Mayweather is avoiding a meeting with Pacquiao. Ultimately, I have no clearer sense today than I did in the past of whether this fight will take place. Before reading Rafael’s article, though, I felt we were as close as ever, because we had a fixed date and a willing Mayweather. The criminal justice system has removed itself as an obstacle. What is clear now is that one hurdle exists, and it’s Bob Arum. Fortunately, it’s a hurdle easily cleared. It’s down to Pacquiao himself to overrule Arum and give a green light to the match he led everyone to believe he wanted all along. This entry was posted in ALDLAND and tagged bob arum, boxing, dan rafael, espn, floyd mayweather, las vegas sun, manny pacquiao, oscar de la hoya, vegas by AD. Bookmark the permalink.